Rubbing to edgesand corners bumped. Spine and covers creased. Chita, the impossible German Shepherd pup whose training presented her owner with so many problems, has now grown into a devoted obedient dog. Joyce is the first to admit that her experiences with Chita heave made her rethink every aspect of dog training and here she tells the story of Chita's success, and of her weekly dog club where all dogs and their owners are welcome for training sessions. 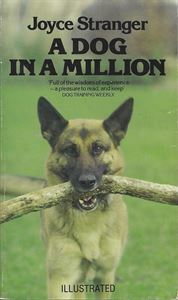 A DOG IN A MILLION is the true story of all the loving care and patience needed to turn an impossible pup into a truly rewarding mature dog.